About Squirrels: The Eastern Gray Squirrel loves to live inside the attics of Pennsylvania homes. Squirrels have two litters of young per year, in late summer and late winter, so people often notice the scurrying of young squirrels in the attic in September or March. Squirrels are rodents, who love to chew on the woodwork of your home, and the electrical wiring inside your attic. 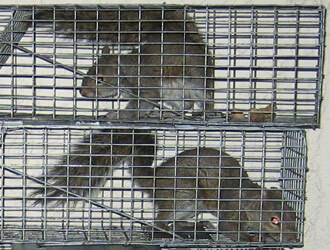 We are experts at trapping and removal, plus total "squirrel-proofing" of your house. Squirrels are a common nuisance animal in southeast Pennsylvania. In Philadelphia and Montgomery County, squirrel have become a particularly common problem, as they have invaded many homes in the area. Tough call. The squirrel might use the open attic stairway, but most of the time, squirrels are stubborn. If it's still there, open the soffit vent. Sorry I didn't get back to you sooner, I was camping in southern AZ last week. The BBCC looks great! Is there anything I can do to support your organization from my squirrel website? Kris, I didn't expect to hear from you and thank you for writing.....IT WORKED!! I DID lower the attic stairs in garage, and within an hour, heard it overhead near the garage...I saw a squirrel outside running on windowsill away from the garage door and toward the other end of house. i quickly peeked outside and saw 2 squirrels racing one another toward their old "doorway" . I quickly closed the outside door, and left the stairway down, in case there were others. its been a week ad no sounds!!! whew! I suspect the only reason it worked was there was another exit provided quickly after it became trapped. so they are running free.....and my attic is once again squirrel free!! camping in AZ sounds fun!!! hope it was great weather.